A beautiful luxury apartment, Gracie’s is created from the imaginative conversion of the historic Maltings building in the Conservation Area of Alnwick town. Gracie’s is just perfect for a couple looking for a luxury base in not only the heart of Alnwick, Northumberland but within walking distance of a whole host of attractions, such as Alnwick Castle and Garden, the famous book emporium Barter Books, and a good range of restaurants, cafes, bars and interesting independent shops. Gracie’s sleeps 2 and is on the 3rd floor of the gorgeous Maltings Apartments which used to be the old Alnwick brewery. The bedroom has a king-size bed (5ft wide) and there’s a large bathroom. The apartment has a open plan kitchen, dining area and lounge, with plenty of huge windows overlooking the pretty fields onto the old school. Gracie’s can also accommodate an infant in a travel cot. There isn’t a cot provided but you’re welcome to bring your own. Sorry, no pets are permitted as it’s impractical and there’s no private outside space with the apartment. The entrance into the apartment building is via grand glass doors and up a glass staircase (lift access is available) to apartment 26, Gracie’s. The gorgeous lounge has a corner sofa, made for relaxing, and windows looking out to a grassy field adjacent to the apartments and a view towards magnificent Alnwick Castle. There’s a large Smart TV with full access to Netflix, as well as a DVD player. The kitchen is well-stocked and has plenty of surface space. It’s perfect for preparing a romantic meal for two. The kitchen has all of the usual appliances, including a fridge, freezer, dishwasher, washer/dryer, microwave, toaster, kettle and Nespresso machine (an initial supply of pods is provided). The dining table comfortably seats two. The pretty and spacious bedroom also looks onto the fields, which is peaceful, provides a sense of space and means the apartment isn’t overlooked. The bed is king-size (5ft wide) and there’s a Smart TV for spending lazy mornings in bed. There’s plenty of storage here too, the bedding is luxury cotton and the duvet and pillows are all hypoallergenic. A hairdryer is provided. Luxury bed linen and fluffy white towels are provided, as well as a hair dryer. 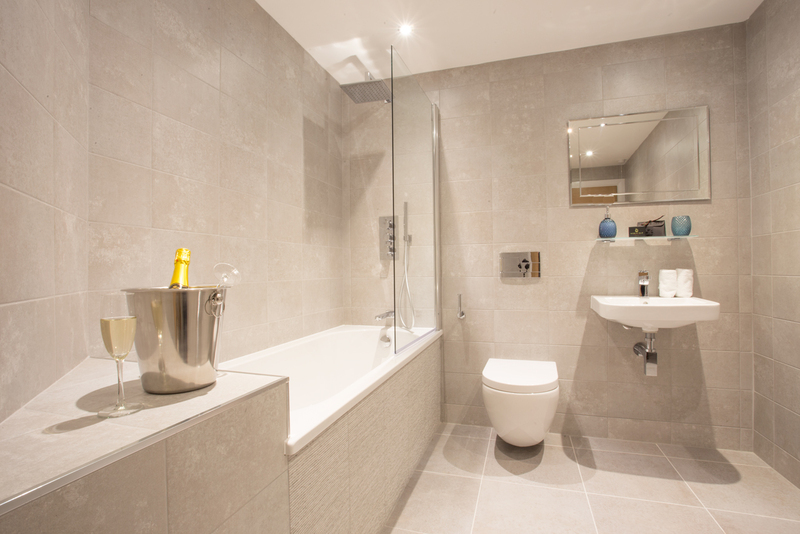 The fully tiled bathroom is incredibly spacious, with a shower over the bath, wash hand-basin, illuminated mirror, heated towel rail and WC. There are plenty of luxury towels and complimentary toiletries by Noble Isle. There’s a private car parking bay for one car in a secure indoor car park on the ground floor of the apartment entrance. You need a key fob for entry, which will be provided with the apartment keys on your arrival. You can park in the guest parking area whilst you collect the keys from the apartment entrance before parking your car permanently in the private secure bay below. The Maltings is a gorgeous apartment development from the old Alnwick Brewery, overlooking the Alnwick Castle in the distance. 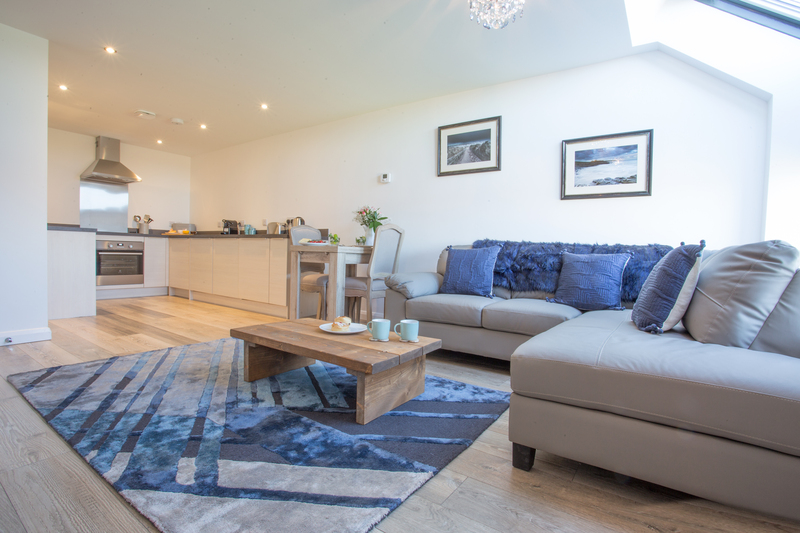 This spacious apartment captures luxury, relaxed living perfectly, with so much space and a light and airy feel, with sumptuous fabrics and local artworks, Gracie’s is a gorgeous Alnwick escape. The bathroom is uber-spacious with a shower over the bath and toiletries by Noble Isle. World famous for being the biggest treehouse certainly in the UK but possibly across the globe, the Treehouse is a very special place for lunch or dinner. It's particularly pretty on an evening with pretty fairy lights lighting the walkways of the treehouse. We recommend you book in advance though! A very special place to dine out in Northumberland is the Alnwick Garden Treehouse Restaurant. It's within walking distance from Gracie's too. Two guests. One baby welcome. One baby welcome. No cot or highchair is provided so please bring your own if required. One bathroom, bath with shower over, wash hand-basin and WC. Heated towel rail. Luxury complimentary toiletries by Noble Isle. Plenty of towels provided. One bedroom with a king-size bed (5ft wide). Hypo-allergenic duvet and pillows. Luxury bedlinen and towels. Hairdryer. No cot available, so please bring your own if required. Sorry no pets are able to be accommodated at Gracie’s. Fridge, freezer, electric oven and hob, microwave, dishwasher, toaster and kettle. Nespresso coffee machine. Washing/dryer, iron, ironing board and vacuum. Hairdryer. Selection of books. Full central heating throughout the apartment. Smart TV’s in both the lounge and bedroom with Freeview and full access to Netflix. DVD player in the lounge with a selection of DVD’s. Free Wi-Fi available throughout the apartment. There is private, secure parking for one car in a covered garage. Gracie’s doesn’t have a private garden or outside space however there are seats outside to enjoy the sunshine and there are lovely walks in and around Alnwick Castle to enjoy on foot from the apartment. With all accommodation on one level and level access from the front door, this apartment is well suited to those with limited mobility, and lift access is available. Please note that the shower is over the bath. Welcome Hamper including luxury Noble Isle toiletries, bespoke Property and Area guide. 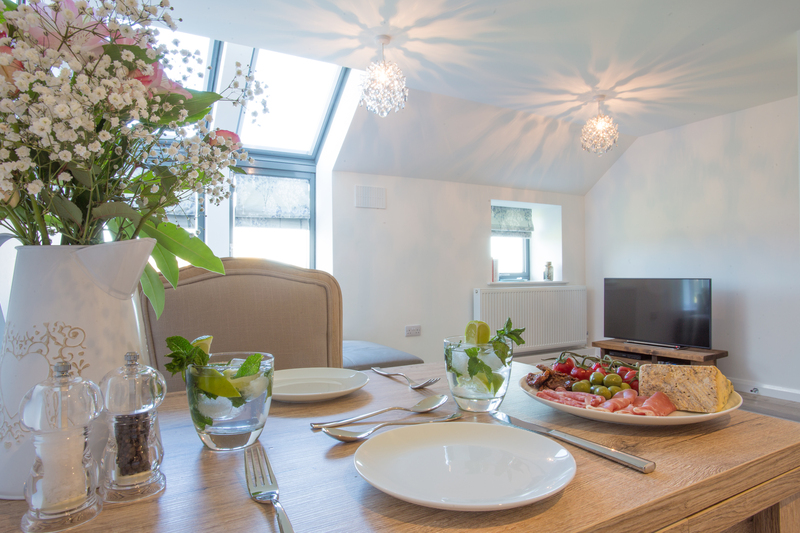 Central location with all the amenities of Alnwick town on your doorstep, including magnificent Alnwick Castle and the world-famous Alnwick Garden. No trip to Northumberland would be complete without a visit to the famous Barter Books, the largest book emporium in Europe. The stunningly beautiful Heritage coastline is just around 10 minutes drive away, and the necklace of pretty coastal villages strung along the Heritage coastline are crying out to be explored, from Amble in the south up to Bamburgh in the north. A drive across the causeway to Holy Island is not to be missed, and a boat trip to the nature reserves of the Farne Islands are unmissable too. Inland The Cheviot Hills and Coquet Valley provide fantastic walking and cycling opportunities and grand country houses such as Cragside, Wallington Hall and Howick Hall provide historical and gardening interest. Being in the heart of this historic town, there’s a good range of both independent and national shops, from small artisan deli’s to Sainsbury’s, good independent restaurants, pubs and bars and cafes. There’s an excellent leisure centre in town, with a swimming pool and other leisure facilities. You have the option of paying either a £150 refundable Good Housekeeping Deposit or a smaller non-refundable £12 Deposit Waiver, which covers you to the value of £150. Please choose which option you prefer when booking. Click HERE for more information. View our amazing footage of The Maltings in Alnwick, to see how close you are to the very centre of the town and Alnwick Castle. Here’s a 3D virtual tour of Gracie’s, click on the image to start the tour, then use your mouse or touch screen to move around, to discover all aspects of the property. 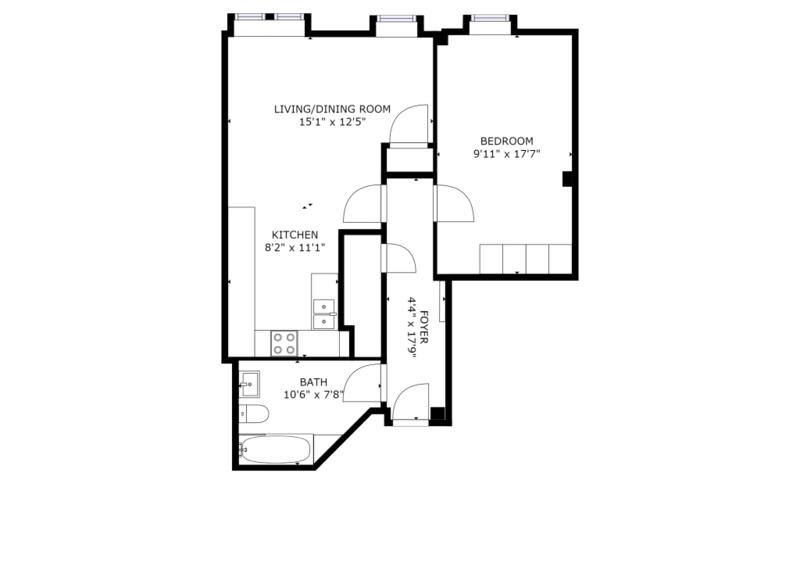 You can click on the floor plan to enlarge it. The apartment is all on one level. Gracie’s is right in the very heart of the medieval town of Alnwick. It’s incredibly well situated for exploring the town, eating out and going for walks too, all without having to get in the car. You can reach Alnwick Gardens and Castle on foot, as well as the famous Treehouse. It will take around 15 minutes easy walk to get there from Gracie’s. You can also discover Barter Books in the centre of the town, as well as many little shops, independent cafes and restaurants, as well as some great pubs. Twice a week, the market place has a farmer’s market too. Hulne Park is also less than 10 minutes walk away from the apartment, which has many routes to take. This fabulous park is part of the Alnwick Castle estate and has so many different routes to take. You can walk from 1 mile to 10 miles if you wish! The nearest beach to Gracie’s is just 10 minutes’ drive in the car at Alnmouth, where you can park right on the beach and walk the length of the entire coast at Alnmouth, around 7 miles in total. 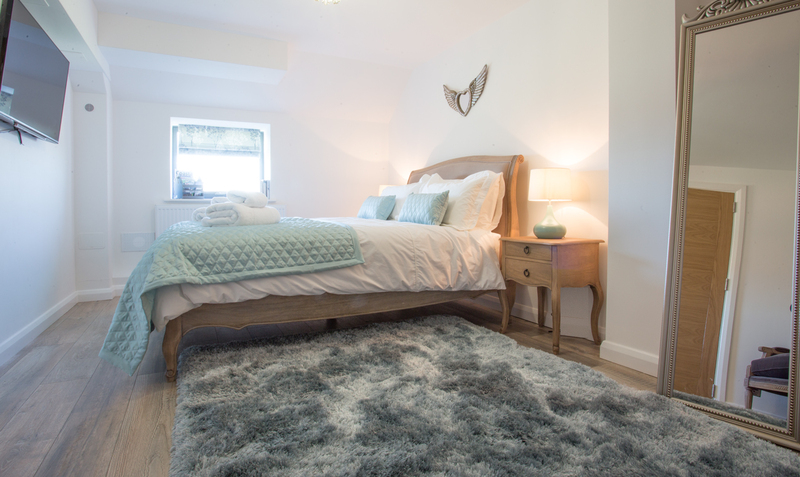 Gracie’s is a gorgeous apartment in a great location, with walks, great places to eat, the coast, shops and historical sites all at your fingertips. Gracie’s is a great apartment and we hope to return. Its so spacious in such a central part of Alnwick town. The quality of the furnishings and fittings is fantastic! Superb view of green fields and the castle out some windows of the apartment. Hike up Thrunton Woods! Just a 15 minute drive from the apartment, Thrunton Woods is a peaceful, impressive man-made forest. Set in the wild moorlands, Thrunton Woods offers gorgeous views across the valley, from a few different walks of varying distance and difficulty. A great day out to get away from it all! Treat yourself to an Afternoon Tea at The Cookie Jar in Alnwick. Dine within the stunning, historic building of the former Convent of Mercy, in the cosy and stylish bistro. There is a full menu option, but the Afternoon Tea in particular is divine and very reasonably priced too! The Cookie Jar has a real luxurious feel throughout, and the staff are very friendly and welcoming. Please note, The Playhouse is closing for refurbishments from September 2018 until September 2019. Visit the Bailiffgate Museum, in the heart of Alnwick Market Town. The museum and gallery is a people’s museum, where fascinating stories of the past are told about the town and district of Alnwick. The town’s old Castle Quarter, which was previously a church, provides a calm and beautiful setting in which to celebrate Alnwick and Northumberland’s distinctive heritage, display special exhibitions and present a range of events. There’s a bit of something for everyone here! “Northumberland and Alnwick have always held very special memories for me. From childhood school trips to family holidays I have always found it to be a magical, beautiful place. There is so much to explore from the beautiful castles, to the rugged coastline, historical buildings and wonderful tea rooms.